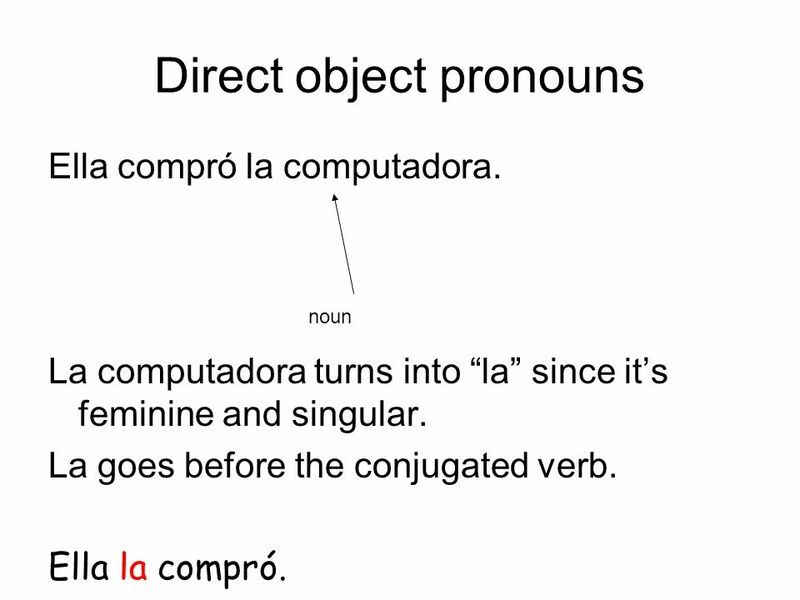 2 Unos ejemplos Yo estudié el español. Yo lo estudié. Ella compró una falda Ella la compró. 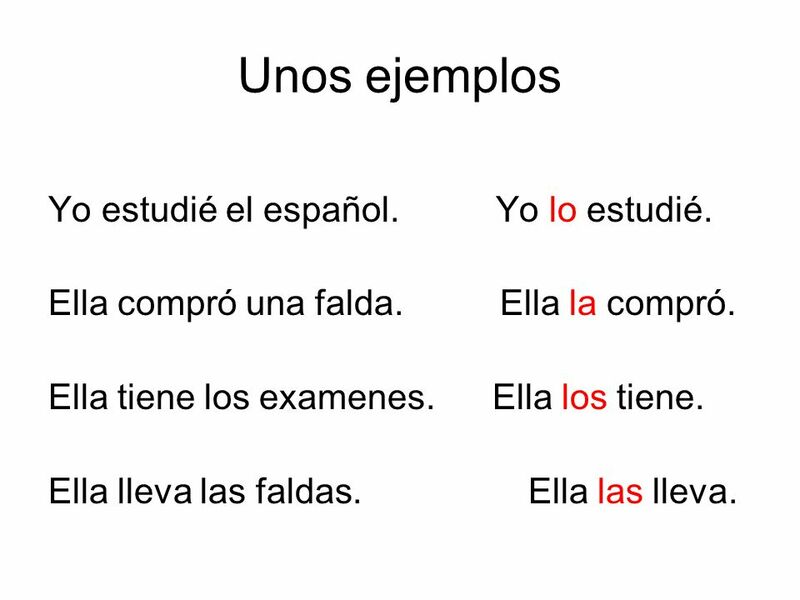 Ella tiene los examenes Ella los tiene. Ella lleva las faldas. Ella las lleva. 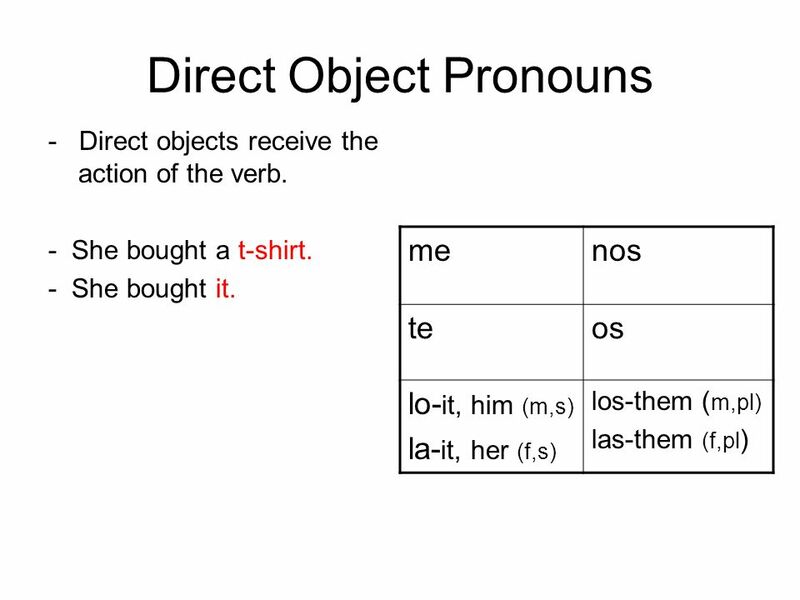 Direct object pronouns can be used for people as well. Ella invita a Juan. Ella lo invita. Nosotros invitamos a los amigos. Nosotros los invitamos. 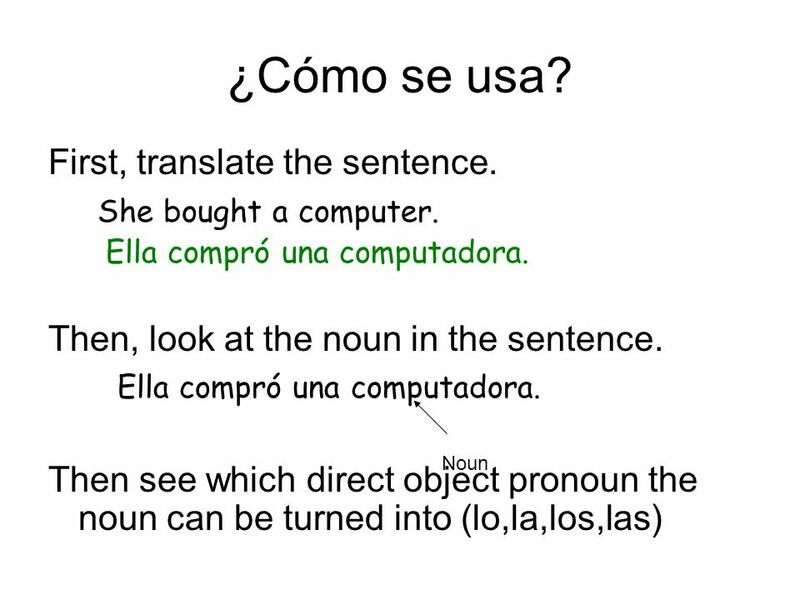 4 ¿Cómo se usa? First, translate the sentence. She bought a computer. 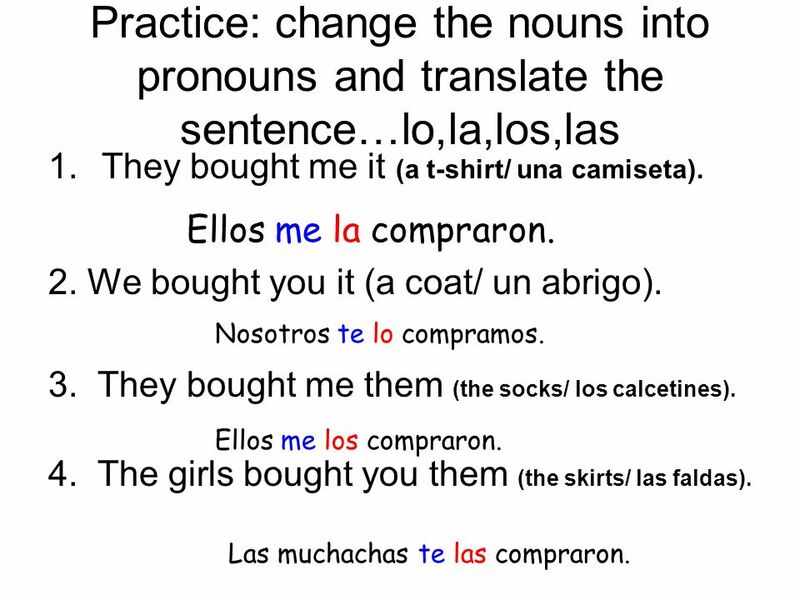 6 Un poco más When you have two verbs we know the first one is conjugated and the second one follows in the infinitive. 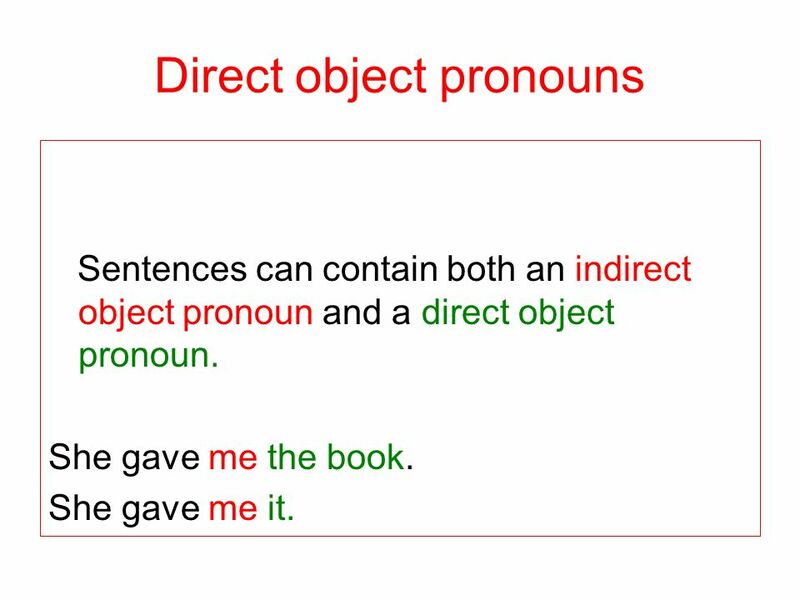 Where would you put the direct object pronoun in this case? Do you have options? Have we seen this before? Ex. 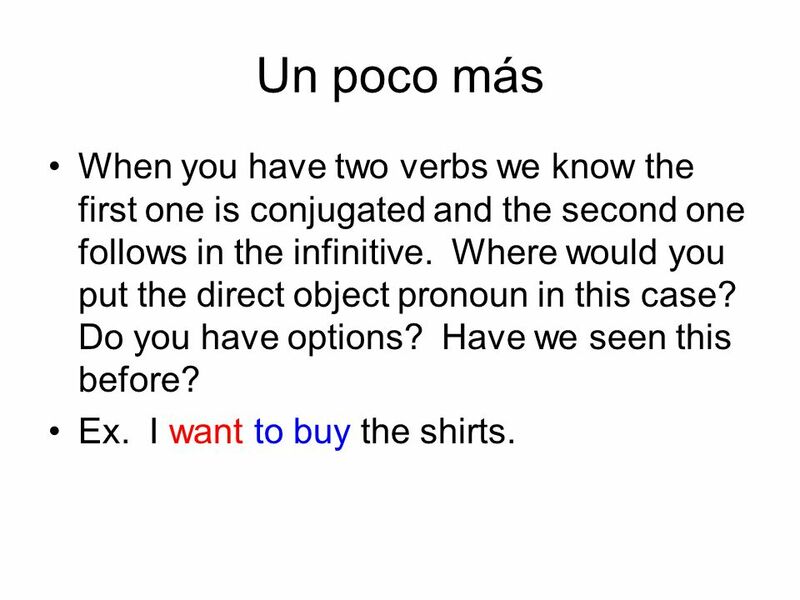 I want to buy the shirts. 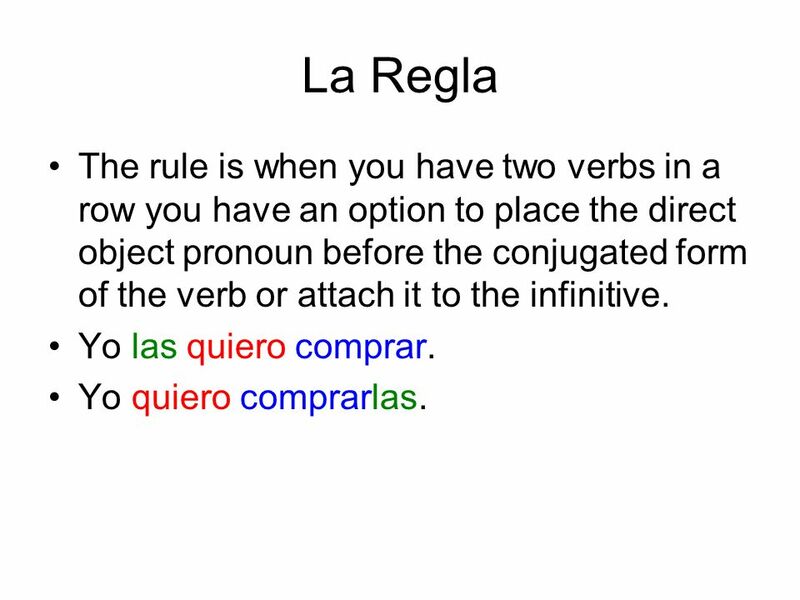 7 La Regla The rule is when you have two verbs in a row you have an option to place the direct object pronoun before the conjugated form of the verb or attach it to the infinitive. Yo las quiero comprar. Yo quiero comprarlas. 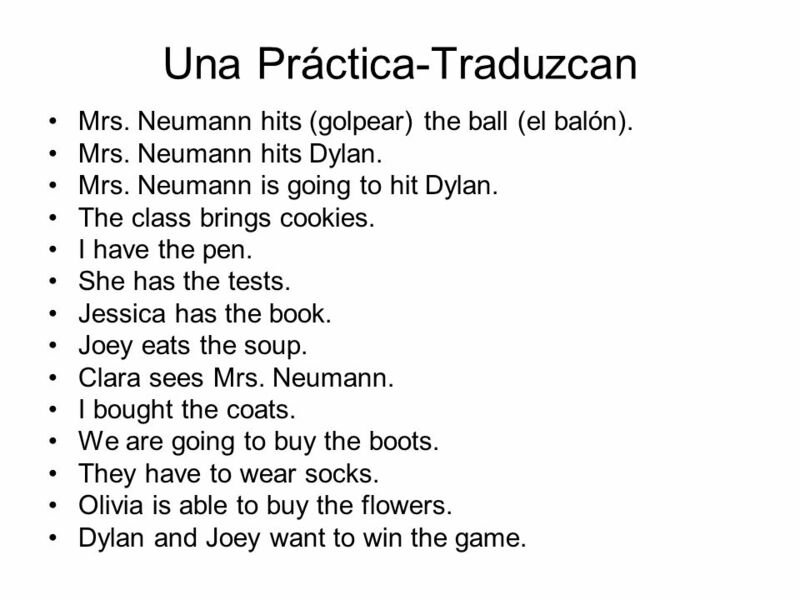 Mrs. Neumann hits (golpear) the ball (el balón). 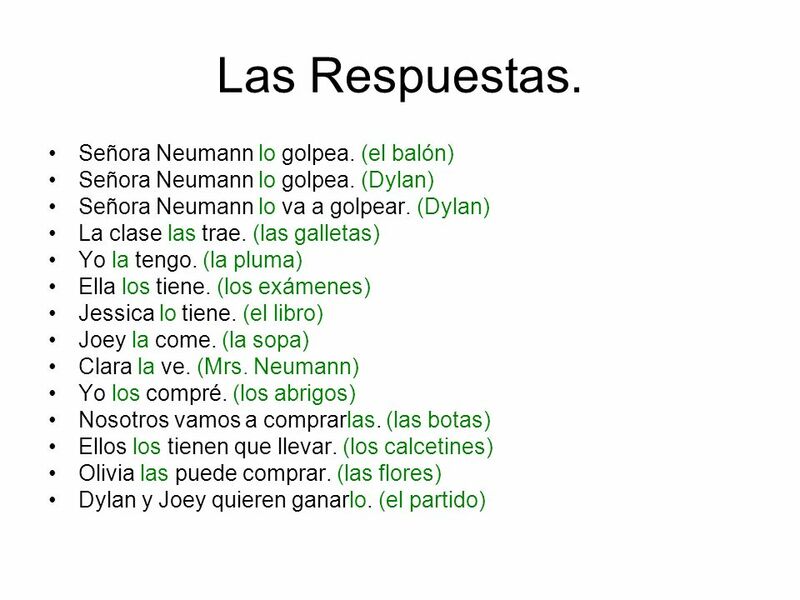 Mrs. Neumann hits Dylan. Mrs. Neumann is going to hit Dylan. The class brings cookies. I have the pen. She has the tests. Jessica has the book. Joey eats the soup. Clara sees Mrs. Neumann. I bought the coats. We are going to buy the boots. They have to wear socks. Olivia is able to buy the flowers. Dylan and Joey want to win the game. 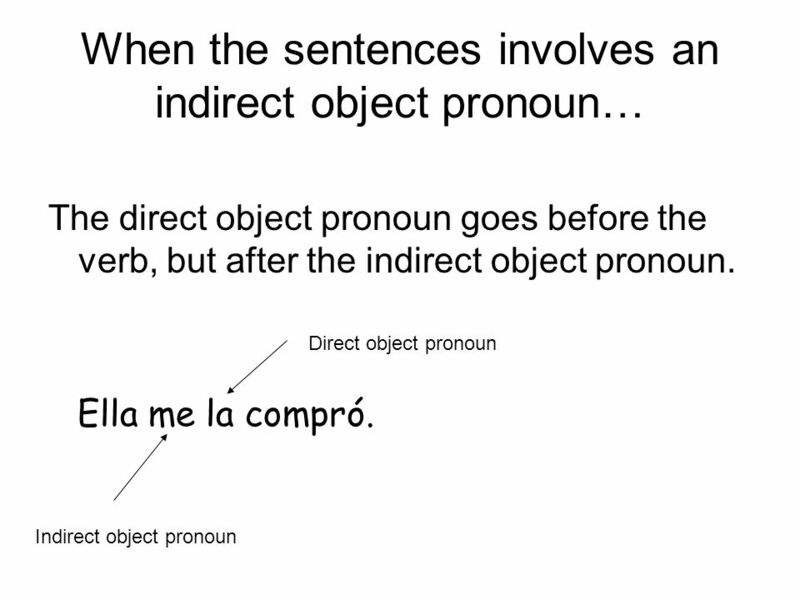 Sentences can contain both an indirect object pronoun and a direct object pronoun. She gave me the book. She gave me it. She bought me the pizza. We bought you the notebook. They copied (copiar) the homework for her. My mom bought them the sneakers. She bought us the skirts. 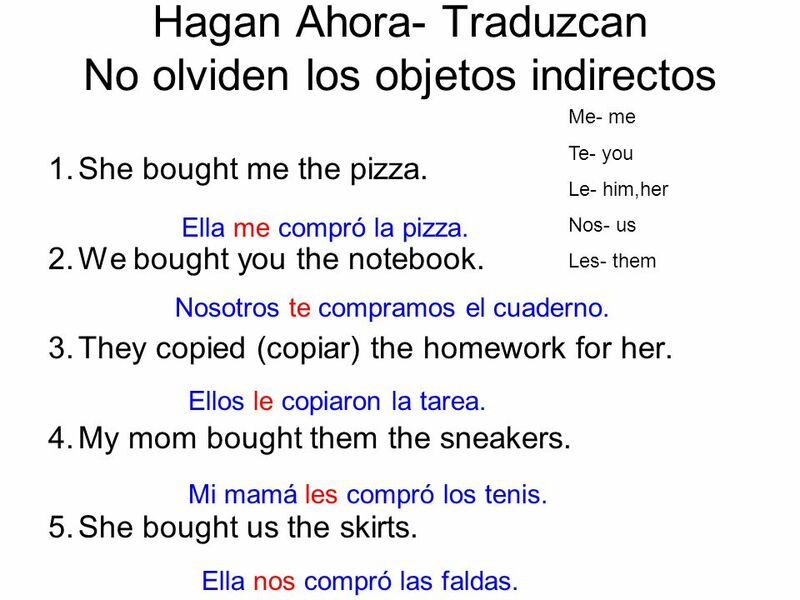 Me- me Te- you Le- him,her Nos- us Les- them Ella me compró la pizza. Nosotros te compramos el cuaderno. Ellos le copiaron la tarea. Mi mamá les compró los tenis. Ella nos compró las faldas. They bought me it. (a t-shirt). We bought you it (a coat). They bought me them (the socks). The girls bought you them (the skirts). 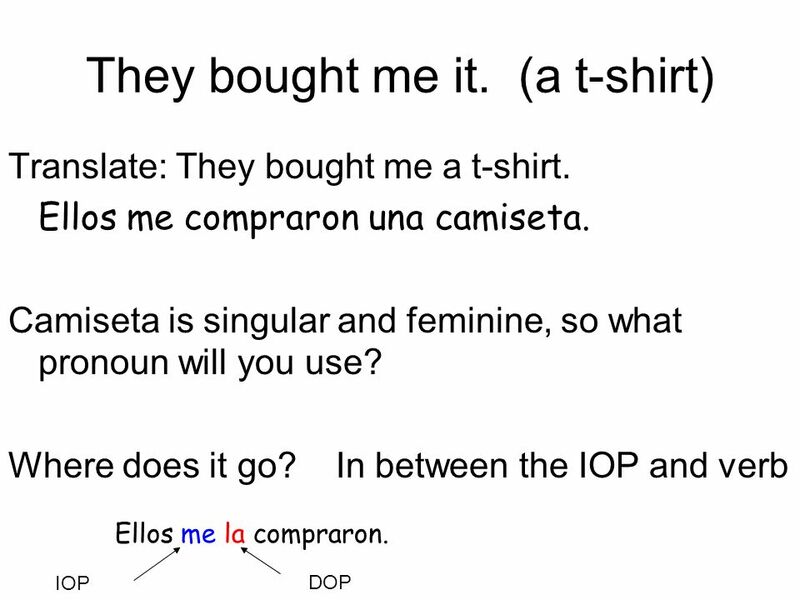 They bought me it (a t-shirt/ una camiseta). Ellos me la compraron. 2. We bought you it (a coat/ un abrigo). 3. They bought me them (the socks/ los calcetines). 4. 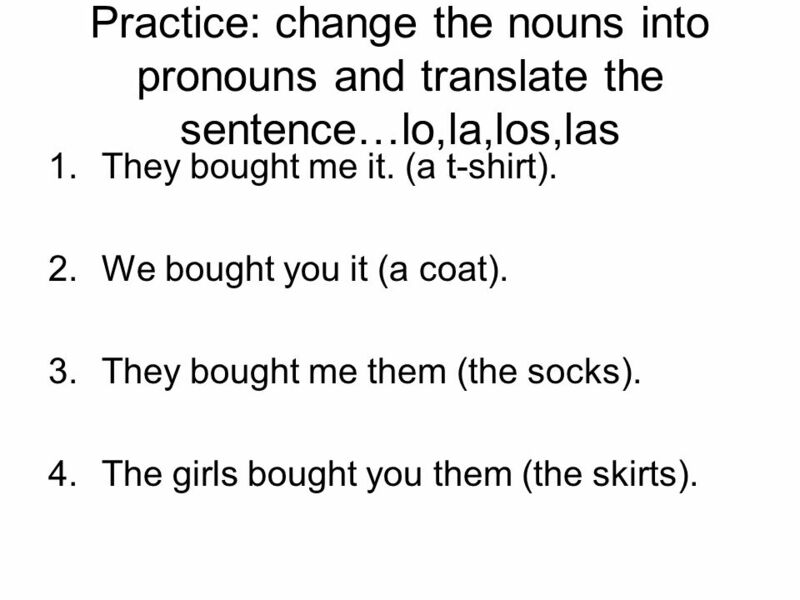 The girls bought you them (the skirts/ las faldas). Nosotros te lo compramos. Ellos me los compraron. Las muchachas te las compraron. 16 La práctica II He saw her. We saw them. 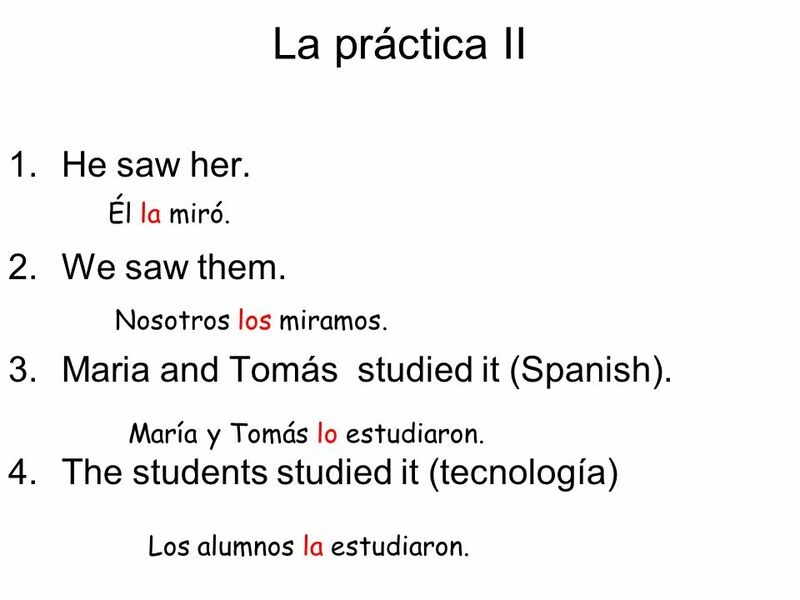 Maria and Tomás studied it (Spanish). The students studied it (tecnología) Él la miró. Nosotros los miramos. María y Tomás lo estudiaron. Los alumnos la estudiaron. 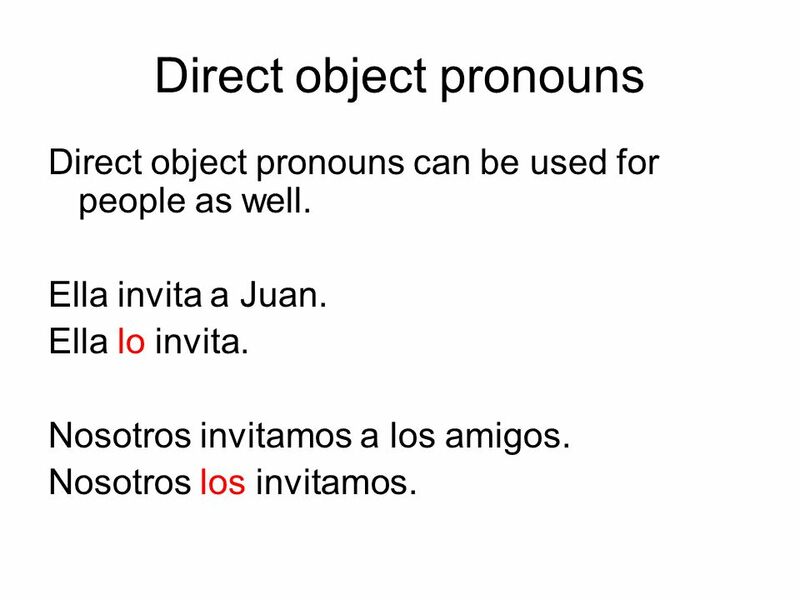 Descargar ppt "Direct Object Pronouns"